Reddy, V., Arunkumar, K., Wadhwan, V., Venkatesh, A. (2017). Giant Peripheral Ossifying Fibroma of the Posterior Mandible-A Rare Case Report. Iranian Journal of Pathology, 12(4), 397-401. Vandana Reddy; Kv Arunkumar; Vijay Wadhwan; Arvind Venkatesh. 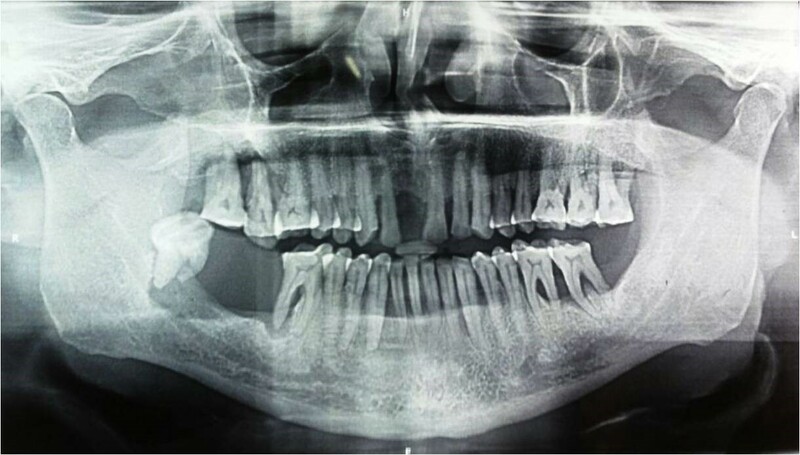 "Giant Peripheral Ossifying Fibroma of the Posterior Mandible-A Rare Case Report". 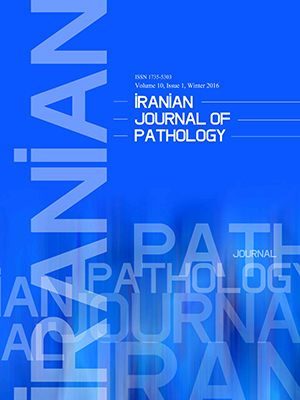 Iranian Journal of Pathology, 12, 4, 2017, 397-401. Reddy, V., Arunkumar, K., Wadhwan, V., Venkatesh, A. (2017). 'Giant Peripheral Ossifying Fibroma of the Posterior Mandible-A Rare Case Report', Iranian Journal of Pathology, 12(4), pp. 397-401. Reddy, V., Arunkumar, K., Wadhwan, V., Venkatesh, A. Giant Peripheral Ossifying Fibroma of the Posterior Mandible-A Rare Case Report. Iranian Journal of Pathology, 2017; 12(4): 397-401. Large, atypical peripheral ossifying fibromas are known as giant peripheral ossifying fibromas. These lesions have often been associated with heterogeneous clinical and radiographic characteristics subsequently leading to their misdiagnosis. Biopsies have been the gold standard for the diagnosis of such lesions. This study reports on an acute presentation of giant peripheral ossifying fibroma, clinically mimicking a malignant lesion due to its atypical presentation along with its characteristic histological features, which led to the establishment of the diagnosis. Peripheral Ossifying Fibromas (POFs) are focal overgrowths, occurring in the gingiva (1).They are also known as ossifying fibroid epulis, peripheral fibromas with calcifications, and calcifying fibroblastic granulomas(2). Clinically, these lesions appearas small, well-demarcated focal masses on the gingivawith a sessile or pedunculated base, usually originating from an interdental papilla (1, 2). The conventional lesionsare typically less than 2cm in size, however it has been recognized that some POFs may grow quite large and may displace the teeth. In such cases, non-typical clinical and radiographic appearance, presence of soft tissue calcifications may lead to misdiagnosis of the lesions (3). Such lesions are generally termed Giant Peripheral Ossifying Fibromas (GPOFs). This report presents a case of rapidly growing GPOF, clinically mimicking a malignant lesion due to its atypical presentation along with its characteristic histological features, which led to the establishment of the diagnosis. 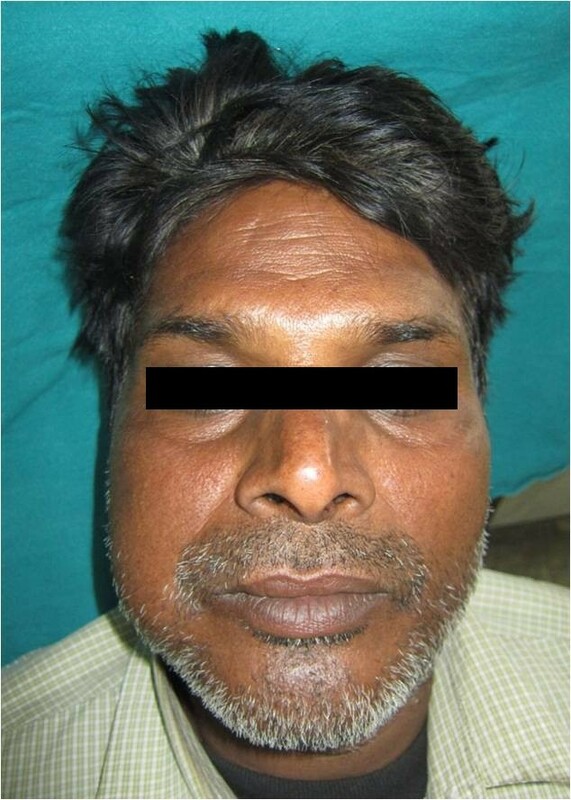 A 55-year-old North Indian male reported to theout-patient service of the current study with a complaint of a swelling in the right side of hisface for 20 days. History revealed that the swelling was initially the size of a pea, and grew rapidly to attain the present size. He also complained of mild pain and discomfort during mastication associated with the swelling. The patient’s medical history revealed that he was not currently under the care of a physician, had no known medical problems, and was not currently taking any medications. He had undergone dental extraction in the area associated with the swelling 6 months prior to referral. He reported that he wasa cigarette smoker, tobacco chewer, and alcoholic for 30 years. Extra oral examination revealed a diffuse swelling of the right side of the face, measuring approximately 5x4 cm in posterior body and angle region of the mandible (Figure 1). There were no palpable submandibular and sublingual lymph nodes. Intra oral examination revealed a pinkish, sessile, bilobed, fibrous soft tissue mass extending distal to the right mandibular second premolar region involving both the buccal and lingual vestibule (Figure 2). The lobes were attached through the edentulous space in the alveolar ridge in relation to 47, which was extracted 6 months prior to referral, and there was considerable posterior displacement of 48, giving the lesion a dumb-bell shaped appearance. The buccal and lingual lobes measured approximately 50x40x30 mm and 50x20x20 mm, respectively. The growth was non-tender, non-compressible, non-fluctuant, and soft to firm in consistency. The mucosa over the growth appeared stretched. Oral pantomograph(Figure 3) revealed soft tissue opacification in the right posterior mandible, extending from region 46 to 48 with displacement of 48 and pressure resorption distal to 48. There was no root resorption in relation to 46 and 48. The radiograph also revealed generalized horizontal bone loss with multiple furcation involvement. Although, the clinical and radiographic appearance of the lesion at the timeof reporting hada benign appearance due to the absence of secondary ulcerations, invading margins, extensive bone loss or involvement of underlying structures, acute history and the extent of the lesion resulted in a wide range of differential diagnoses to allow a range from benign to aggressive malignant lesions. The differential diagnoses included peripheral myxoma, pleomorphic adenoma, mucoepidermoid carcinoma, aggressive fibromatosis, giant POF, nodular fasciitis, sarcomas, and metastatic carcinomas. 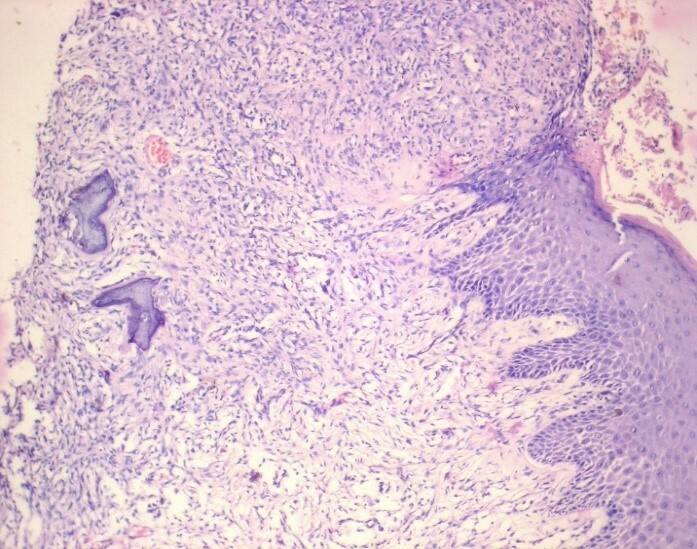 An incisional biopsy was made from the growth in the buccal vestibule, which revealed hyperplastic parakeratinized stratified squamous epithelium, which was ulcerated at large, covered with a fibro-purulent membrane and a subjacent area of granulation tissue (Figure 4). Deeper areas showed highly cellular fibroblastic proliferation and associated mineralization, which consisted of mainly woven and trabecular type of bone along with areas showing dystrophic calcifications (Figure 5). 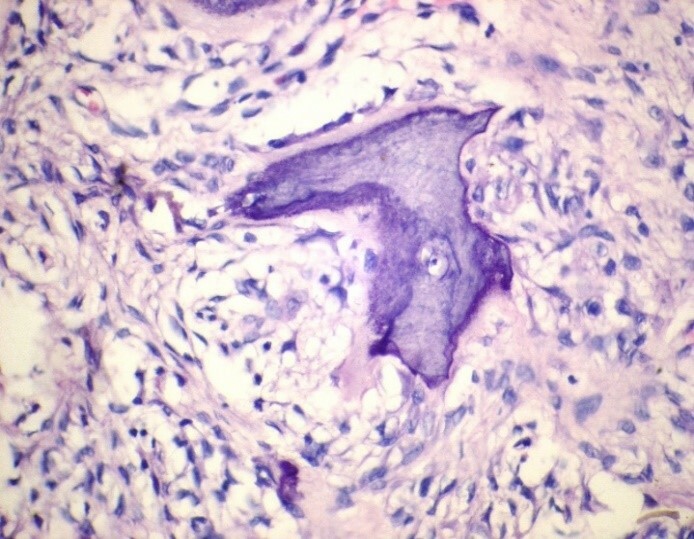 Based on the histopathological features, a diagnosis of peripheral ossifying fibroma was made. 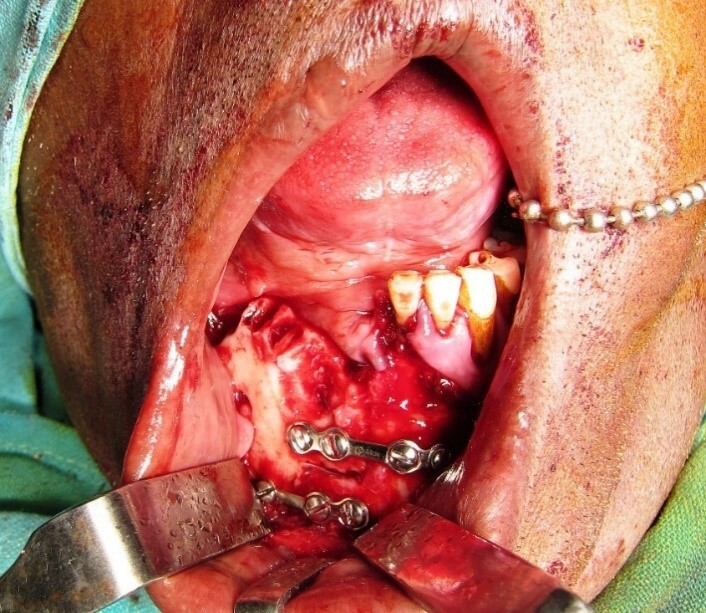 An access step osteotomy was performed at the right body and alveolar region for better visualization and complete excision of the lesion, which had extension to the floor of the mouth (Figure 6).The excisional biopsy of both lobes revealed features concurrent with the incisional biopsy. Peripheral Ossifying Fibromas are relatively common gingival growths, which are considered to be reactive in nature (2). In 1982, Gardner described the nature of the POF, which had earlier been considered the extraosseous counterpart of the central ossifying fibroma (4). Plaque, calculus, rough restorations, ill-fitting dentures, microorganisms, masticatory forces, minor trauma, trapped food and debris, and iatrogenic factors all influence the development of these lesions. In most instances, a POF lesion is associated with radiographic signs and tooth migration (5). Hence, POF is considered not to be neoplastic, andrather a hyperplastic reaction due to inflammation (6). Although POFs are generally less than 2 cm in theirmaximum dimension (1, 2), larger atypical presentations have been documented. Such lesions have been referred to in the literature by several names, such as giant, large, atypical, huge, gigantiform POFs (7-16). Childers et al. in 2013 proposed the usage of a uniform standard terminology ‘Giant POF’ for atypical POFs to facilitate proper documentation of such presentations (3). The clinical and radiographic features of GPOFs against that of conventional POFs have been tabulated in Table 1. 1/10 case showed recurrence after 2 months; 6 cases showed no recurrence in follow up time ranging from 2 to 120 months. Larger lesions with an acute onset (12) similar to the currentcasehave been very rarely reported. The clinical, radiographic, and histological features of GPOFs reported in literature have been tabulated in Table 2. This atypical clinical presentation led to the impression of an aggressive or malignant lesion leading to the wide range of differential diagnoses, which were considered before the histopathological confirmation was obtained. While it is well accepted that POF is most likely a reactive lesion, few cases of GPOF are known to clearly establish the pathologic process (3). Amongst reactive lesions of the oral cavity, POFs show higher mast cell count compared to pyogenic granuloma and peripheral giant cell granulomas (18). It has been reported that mast cells play a role in normal angiogenesis and in pathological angiogenesis that occurs in inflammatory diseases and tumors (19). More studies of GPOF have to be conducted to clarify recurrence, pathologic process, and establish whether GPOF has sufficiently distinct characteristics from POFs. Although GPOFs are rare, such lesions have to be considered during differential diagnoses even for huge lesions with acute onset similar to the present case. Incisional biopsies should be performed for such lesions in order to obtain a confirmatory diagnosis, which will aid abundantly for treatment planning. Biopsy technique for the sampling of such lesions can be critical. Care should be taken to harvest tissue fromthe deepest possible part of the lesion, as thisis necessary for diagnosis of such lesions. Conﬂict of interest: The authors have no ﬁnancial relationships with any organization.